Sony has announced details of its latest PlayStation 3 gaming console and handheld PlayStation Portable. A 160 GB PS3 was unveiled at the Leipzig games conference that will go on sale on 31 October in Europe and November in the US. Also shown off was a wireless keypad which interfaces with PS3 controllers that will allow touch typing. Upgrades to the PlayStation Portable include a built-in microphone and an anti-reflective screen. The new 160 GB PS3 will be sold as a bundle that includes a limited edition of Uncharted: Drake's Fortune, and will go on sale 31 October for 449 euros (£355), and shortly thereafter in the US for $500. The recently announced 80 GB version has now started shipping and will sell for 399 euros or $400. No UK prices have yet been given and may end up being higher than direct conversions suggest. "Consumers also are utilising PS3 as an entertainment hub for their digital media, placing content such as their entire music collection on the hard drive," said Jack Tretton, who heads up the American part of the entertainment giant's games arm. "The 160GB PS3 system addresses this growing consumer demand." In the US, the 160GB version will come with a voucher for the PlayStation Network game PAIN; European buyers will instead receive vouchers worth 70 euros for downloadable content. A wireless keypad, designed to work with the existing PS3 controllers, was also shown off, to allow direct typing rather than use of the on-screen keyboard. The keypad is Bluetooth-enabled, and at the touch of a button converts into a touchpad-style mouse. No price for the keypad was given. 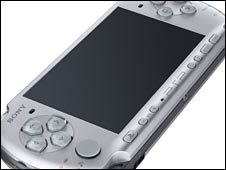 Sony also unveiled an upgraded version of the PlayStation Portable, called the PSP 3000. With the same dimensions of the PSP Slim & Lite, the new version sports an antireflective screen with a wider palette of colours and higher contrast ratio. It will also have a built-in microphone for headset-free use of the built in Skype interface as well as the voice functions in some games. The PSP 3000 will hit shelves worldwide 15 October, bundled with the game Ratchet and Clank for $200 in the US and 199 euros in Europe.